In her most recent book, Laurie Notaro successfully writes another laugh-out-loud collection of stories from her everyday life. 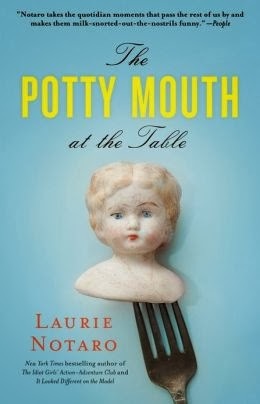 As with her previous books, The Potty Mouth At The Table is a collection of essays with Laurie's humorous take on everyday occurrences. Whether it's things you never want to hear again while waiting in line at the pharmacy or an uncomfortable experience navigating through airport security, Laurie has the guts to say what we're all thinking in these situations. She just actually says it and puts a hilarious spin on each of these circumstances. I really admire someone who can manage to take her personally embarrassing stories and share them in a comical way. Laurie writes about being ill in public from food poisoning and publicly snubbed and humiliated by another writer who calls her "a potty mouth." Embarrassing things happen to everyone at one time or another. While most of us would like to forget about these awkward situations, Laurie shares her embarrassing stories with us and encourages us to laugh with her. She truly has a hilarious perspective on everyday situations. Laurie is sarcastic. She exaggerates. She is also a germaphobe. I thought she was just a little bit crazy and over the top when she writes about other people in her home using her shower pouf, until I found myself having EXACTLY the same conversation with someone in my household about ear buds. Some things just don't need to be shared. In The Potty Mouth At The Table, Laurie writes about her fabric obsession that has reached "hoarder status." She also writes about her furniture hoarding and about how she cannot pass up a good deal on antique and used furniture. She may not have a place to put the beautiful red chair she finds at her favorite thrift store, but she is compelled to bring it home with her. She even writes about some ridiculous trends on Pinterest such as mason jars, crock pots, and over the top, artistic kid's meals. If you've read previous books by Laurie Notaro, this one isn't much different, but that's ok. She has a formula for funny and it works every time. I love a funny book. Thanks for the great suggestion, can't wait to go find it on my kindle! You're welcome! Hope you enjoy this book as much as I did!